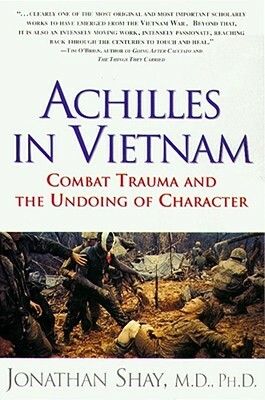 An original and groundbreaking book that examines the psychological devastation of war by comparing the soldiers of Homer’s Iliad with Vietnam veterans suffering from post-traumatic stress disorder. In this moving, dazzlingly creative book, Dr. Shay examines the psychological devastation of war by comparing the soldiers of Homer’s Iliad with Vietnam veterans suffering from post-traumatic stress disorder. A classic of war literature that has as much relevance as ever in the wake of the wars in Iraq and Afghanistan, it is a “transcendent literary adventure” (The New York Times) and “clearly one of the most original and most important scholarly works to have emerged from the Vietnam War” (Tim O’Brien, author of The Things They Carried). Jonathan Shay is a Boston-area psychiatrist whose patients are Vietnam combat veterans with severe, chronic post-traumatic stress disorder in the Department of Veterans Affairs Outpatient Clinic. He is also on the faculty of Tufts Medical School. He lives in Cambridge, Massachusetts. Thomas E. Neven Marine Corps Gazette Shay's astute analysis of the human psyche and his inventive linking of his patients' symptoms to the actions of the characters in Homer's classic story make this book well worth reading for anyone who would lead troops in both peace and war. Herbert Mitgang The New York Times A transcendent literary adventure. His compassionate book deserves a place in the lasting literature of the Vietnam War.